Newton Baby's flagship product is not for the budget conscious, but the cost is well worth the peace of mind that comes with the comfort and safety provided. What’s in a Newton Wovenaire Crib Mattress? What Can Be Used with the Newton Wovenaire Crib Mattress? What’s the Weight Capacity of the Newton Wovenaire Crib Mattress? Does Newton Baby Offer a Sleep Trial, Return Policy and Warranty? How Much Does the Newton Wovenaire Crib Mattress Cost? Founded in 2014 and headquartered in New York, Newton Baby remains small and privately held. Founder Michael Rothbard is an industry veteran with track record showing a penchant for introducing innovative bedding products to the market. When he became a father, his focus shifted to creating safer, more comfortable and more effective sleep solutions for children. 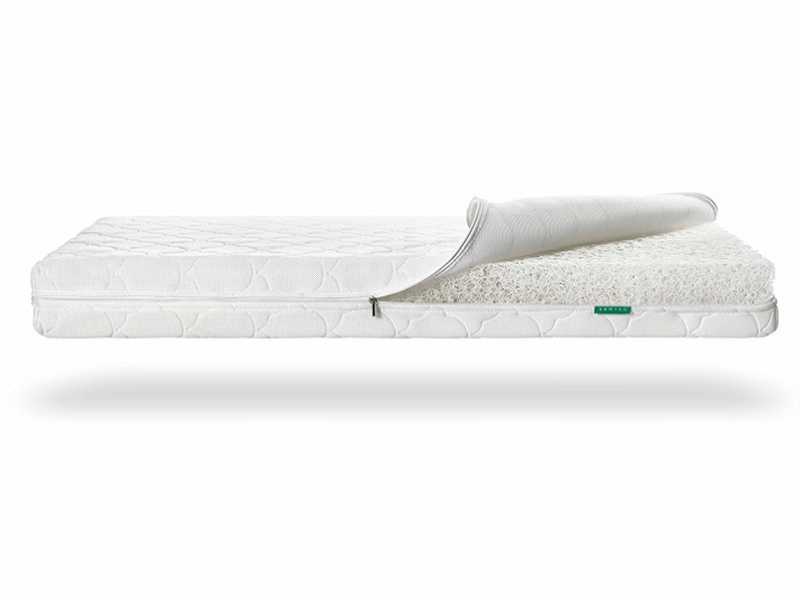 The company enjoys a stellar reputation due to a consistent and excellent flagship product launched in 2015: the Newton Wovenaire crib mattress. Though popular and well-received by parents, press and medical professionals alike, of course nothing beats personal research and preference. Here are the facts! We mentioned that the Newton Wovenaire crib mattress is innovative, but what’s unique about it is that the innovation results in a simplification of product design. None of the usual convoluted layering of multiple materials here. The full interior of the crib mattress is made of 5.5 inches of Wovenaire. Talk about simplicity! That’s it. No coils or springs; and no poly foam, memory foam, or latex foam. Through the use of this special cushioning material, Newton Baby has managed to create a great product. It is purportedly breathable, hypoallergenic, lightweight, non-toxic, washable, and 100% recyclable—all while being comfortable and safe. Wovenaire is created in a pool of water, by weaving and forming a food-grade polymer while it is completely submerged. This material is the result of Japanese technology. Each piece of Wovenaire then solidifies into a form that fits crib mattress dimensions. The resulting cushioning material is very lightweight but resilient. 90% of its volume is actually air! Only 10% of the entire three-dimensional interior is made of the food-grade polymer. The use of a food-grade polymer for a mattress is not as unique as it sounds. As a side note: Mattress maker Purple has also described their patented material in similar terms, though the two materials are quite different in look and feel. Wovenaire is Greenguard Gold certified. Newton Baby further claims that it does not off-gas or otherwise leach chemicals that may be harmful or toxic. What Is the Newton Wovenaire Crib Mattress Cover Made From? 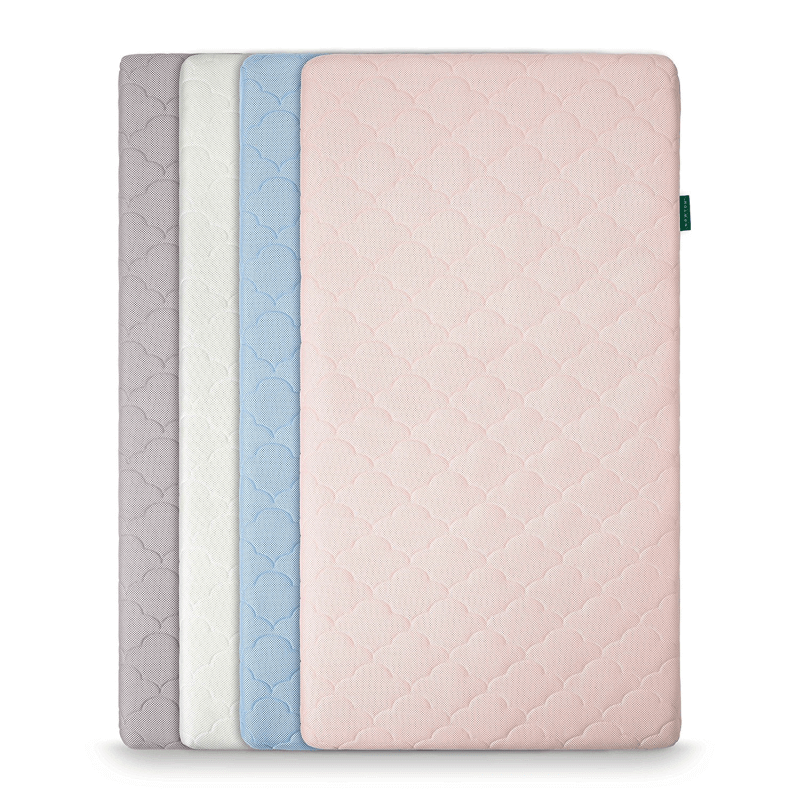 The crib mattress cover is comprised of two layers of breathable fabric, both 100% polyester, that are quilted together. The company calls it a 3D cloud cover. 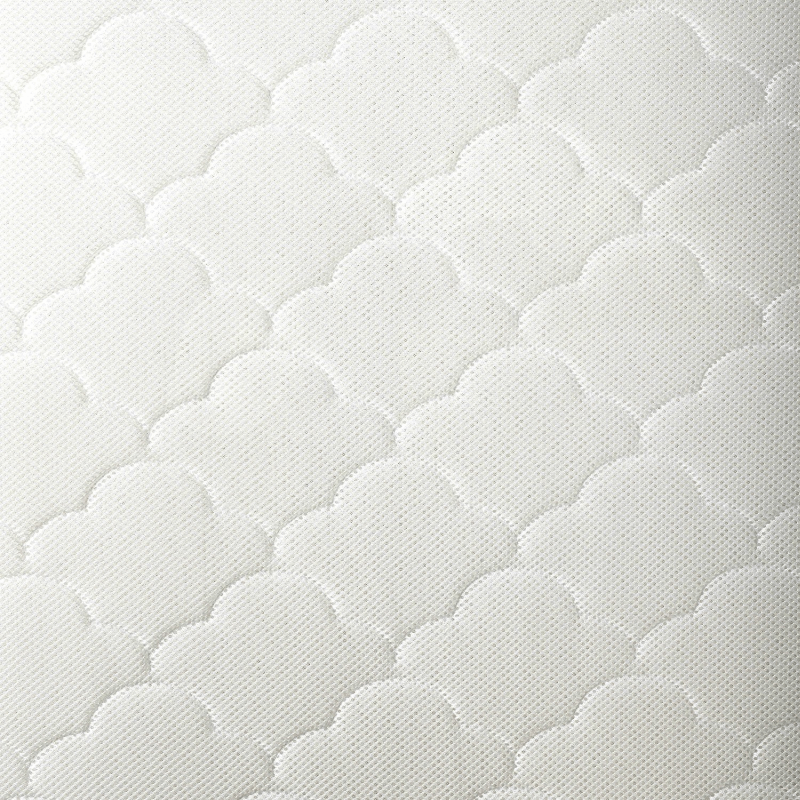 The patterns form little clouds that are supposed to create “soft pillows of air”, as Newton Baby puts it. It is not waterproof, but water resistant. This is on purpose! Waterproofing through the use of synthetic material increases the risk of heat retention and bacteria formation, and it would complicate the product’s design. Instead, the cover and the mattress core are both completely washable. The cover has a full zipper all around for easy removal and replacement, too. No, there is no fire sock; but there are no chemical fire retardants, either. Wovenaire itself has a halogen and heavy metal-free solution within it, in the form of natural phosphates. This meets the fire safety standards required by US law. Can You Customize the Newton Wovenaire Crib Mattress? The Newton Wovenaire Crib Mattress comes in two sizes: standard and mini. It is also available in four colors: cloud white, sunrise pink, moonlight grey, and sky blue. The standard size is 28 inches by 52 inches, weighing 11 pounds. The mini size crib mattress is even smaller and lighter at 24 inches by 38 inches and eight and a half pounds. Though it’s an unfamiliar material to most of us, Wovenaire is very durable, which explains Newton Baby’s limited lifetime warranty. It is meant to grow along with your little one, especially if you buy the standard size. Because it is washable and made of tough stuff, you can expect it to be usable until your child is a toddler. 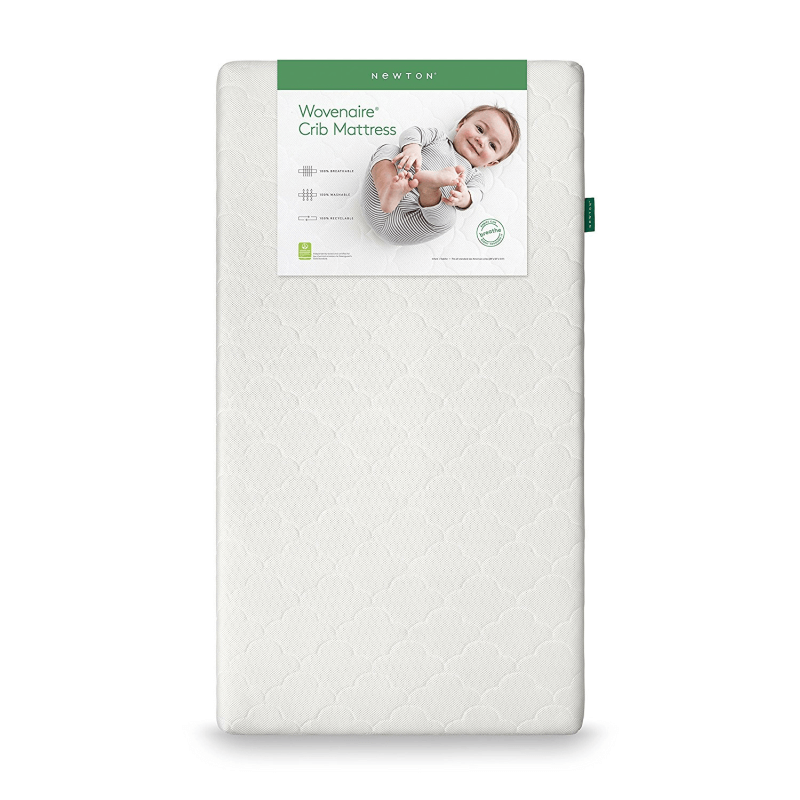 The Newton Wovenaire crib mattress can even be handed down to another child, good as new, after your first outgrows it. If, for any reason, you wish to have it recycled instead, you can contact Newton Baby and they will help you find the closest available facility or send return packaging so they can arrange the recycling process themselves. This crib mattress highly breathable, too, because the interior is 90% air and only 10% food-grade polymer. The materials are already hypoallergenic, and the structural breathability does a lot to keep humidity and moisture within the mattress low. Coupled with frequent cleaning, this greatly discourages bacteria, fungi and mold growth; and keeps dust mites and other pests and allergens at a distance. The biggest advantage of the breathable design is that it significantly lowers the risk of suffocation and overheating. If your baby sleeps hot or has an alarming tendency to roll over to a face down position, this mattress may be perfect for them. Newton Wovenaire crib mattresses should fit snugly on most cribs made for the sizes available. However, if there is a gap of over an inch—roughly the width of two fingers—between the mattress side and the crib wall, you should not use them together. That gap may create a suffocation hazard! Unfortunately, if you need a custom mattress size for a custom crib, Newton Baby will not be able to provide that. Providing the two sizes is already more than some of their industry counterparts to. Newton Wovenaire crib mattresses also have corners that are the sweet spot between squared off and being too pointy, and rounded and prone to leaving a hazardous gap. Newton Baby does not recommend using a waterproof protector over their product, as this would negate the whole point of choosing a breathable and washable mattress for your baby. Instead, they suggest breathable cotton sheets, such as the Aden+Anais muslin sheets that are also available on Newton Baby’s official online store. Newton Baby replacement mattress covers are also available for easy changing during hectic nights and unforeseeable messes. How Do You Set Up the Newton Wovenaire Crib Mattress? There is no setup, really. It is as easy as unpacking it and putting it in the crib. You can wash the mattress and the cover before use, but Newton Baby insists that this is an unnecessary step. Both the standard and the mini sizes of the Newton Wovenaire crib mattress are ridiculously easy to carry around and transport. When we say lightweight, we mean it! Basically, if you can carry your baby, you’ll have no problem lifting and moving the Newton Wovenaire crib mattress. How Do You Clean the Newton Wovenaire Crib Mattress? The only real rule here is that you should avoid heat at all costs when cleaning the Newton Wovenaire crib mattress and its cover. A huge selling point of this product is that it can be cleaned and washed as often as you wish. The ease at which you can pick up this mattress, as well as the fact that you can wash both the cover and the Wovenaire core, make cleaning up after nighttime and nap time accidents much less of a hassle. You can hand wash or use a washing machine for the cover. As for the Wovenaire core, you can run water over and through it in your tub or shower area. For both, remember to use mild detergent and cool or cold water. You can tumble dry the cover on cool settings or simply hang to air dry. To dry the mattress: Rinse well, shake it until all the trapped water within comes out, and then lay it somewhere to rest in a well-ventilated space until it is ready for use. Setting both in front of a fan can speed up the process, but remember: No heat! This means no hot water and no hot air. Do no use a blow dryer. Heat will damage or shrink the product. We had to look for quite a bit to find it, but the answer to this question is on the official website. The Newton Wovenaire crib mattress has been tested and can support up to 100 pounds! Seems unbelievable, but that’s a statistic from the company itself. In other words, it will do fine well into toddler ages and even beyond. How Does the Newton Wovenaire Crib Mattress Feel? We’ve already mentioned the fact that it is great when it comes to having low heat, humidity and moisture retention. 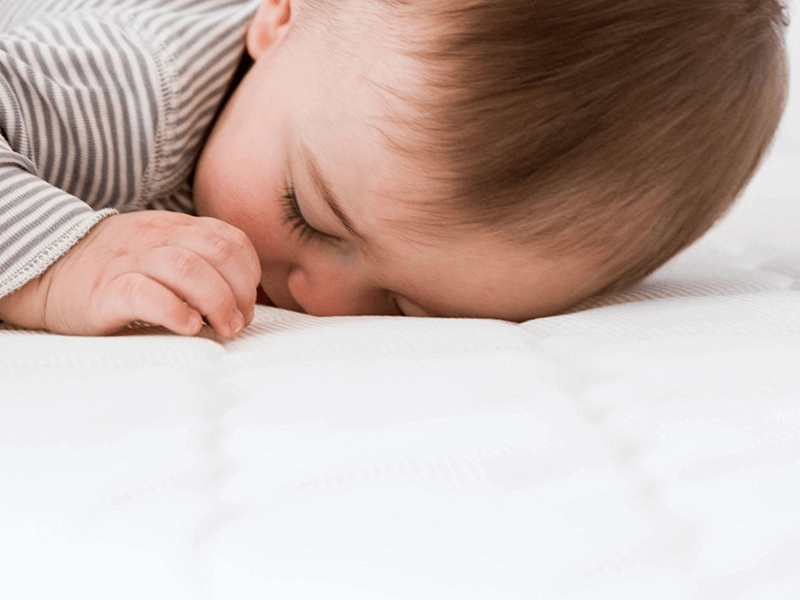 Newton Baby also states that the product is of a “recommended firmness” that is able to provide a comfortable sleeping surface to both infant and toddler. No need to flip the mattress, as the feel will not change either way—though you are free to do so if it makes things easier for you. Newton Baby does business with community, quality, innovation and transparency as their guiding principles—and it shows. Many crib mattresses and accessories are designed and marketed as being the best for your baby. But with the hassle-free maintenance and use of the Newton Baby crib mattress, we feel that this product is also designed to be great for caregivers, guardians and parents. How much should we really trust a new brand with a new product made with new technology, though? Well, that depends on you. In our opinion, though, Newton Baby’s commitment to both community and transparency—two of their four guiding principles—makes the newness of it all less daunting. It helps that they’re an American company, too! However, while Newton Wovenaire crib mattresses are assembled and tested for quality in the USA—at a clean and emissions-free company facility in Tennessee—there is definitely an international slant to this process. For one thing, even though the Wovenaire material is made in the USA, the technology that is used to create it was developed in Japan. Curiously, though, we could not unearth a single mention of it anywhere online that wasn’t linked this crib mattress. Also, the mattress cover used is made in China; though quality control in the US facility should assuage any unfounded fears related to that. How is Newton Baby’s Customer Support? The FAQ on the official website is extensive, and customer support is friendly and knowledgeable. You can contact Newton Baby via telephone or email. They also have a helpful Zendesk-run help option that bundles in a search engine and a contact form in one—sort of like automated live chat. There is a return policy and a 100-night trial period. The Newton Wovenaire crib mattress also comes with a limited lifetime warranty and a “lifetime fit” guarantee. Non-mattress Newton Baby products should be returned within 30 days of purchase, unused and undamaged. Because of the 100 night trial—only valid if you purchase from Newton Baby’s official website—the period during which you can return a Newton Wovenaire crib mattress is likewise extended. Successful returns will be refunded in the same form as its original payment. An added bonus: Newton Baby’s 100 night free trial can start when your baby arrives! You can indicate your due date when you register the crib mattress on the official website warranty page. The trial will start from the due date, ensuring that it is your baby that is making full use to the generous trial period. It bears repeating, because this may be a point of confusion for excited customers: If you purchase the crib mattress through any other retailer and not through the official website, that store’s return policy will be honored and you will not get the 100 night trial period. Note that large online retailers may have refund and return policies that can span months, as well. Like most mattress warranties, Newton Baby’s doesn’t apply to normal and everyday wear and tear. Damage or abuse of the material, accidental or not, isn’t covered. Improper handling and use is also not covered, so be careful when transporting it. And again, don’t use heat in the cleaning process! It may be counter-intuitive to some, but it is how to properly take care of the product. There is also what Newton Baby calls a “lifetime fit” guarantee. If you notice that the mattress no longer fits snugly around the sides of your crib anymore, you may contact Newton Baby about it, and they may arrange for a free replacement. A standard size Newton Wovenaire crib mattress is available for $299.99 on Amazon and on the official website, while the mini size is a little lighter on the budget at $249.99. We’ve been enamored by the Wovenaire technology and all it entails regarding durability and ease of use, but if there’s anything that we would point out as a disadvantage, it would probably be the price point. This is a very expensive crib mattress, even compared to other high end industry counterparts! Also worth noting that there are additional fees if the order needs to be shipped to a non-continental US state like Alaska or Hawaii. Fortunately, there are financing options available through Newton Baby’s partnership with Affirm. This allows you to choose a payment plan, get a loan, and benefit from installment billing. Visit Amazon & Find Newton Wovenaire Crib Mattress Deals Now! We love the idea of a lightweight and resilient mattress that is very easy to maintain. And more than anything, the superior airflow due to the material and simple design does a lot to ease fears when it comes to a little one’s sleep habits. At Good Night’s Rest, we appreciate innovation and technology, and this product goes above and beyond when it comes to those. That being said, we have the usual apprehensions and qualms that are typical when dealing with new products from new brands, and this is not helped in the least by the hefty price tag. However, the generous trial period and limited lifetime warranty adds value and a mental safety net of sorts. The warranty adds a measure of confidence in using the mattress longer than usual—from infancy to toddler years, possibly for more than one child—and still expecting the same quality and comfort. And if for some reason, your baby does not sleep well on the Newton Wovenaire crib mattress, the trial will ensure that you won’t be stuck with an expensive item that will just gather dust. Overall, if cost is not an issue—and particularly if your baby sleeps hot or has a tendency to lie face down—the Newton Wovenaire crib mattress is a great choice that is definitely worth at least trying. We heartily recommend it.